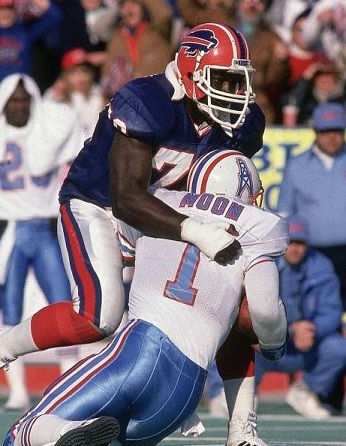 The AFC Divisional Playoff game on January 1, 1989 featured the conference’s best defensive team, the Buffalo Bills, against a club with the second-ranked offense in the NFL, the Houston Oilers. While the Bills had a bye the previous week, Houston had narrowly defeated the Cleveland Browns by a 24-23 score to advance. The resurgent Bills, coached by Marv Levy, were in the postseason for the first time since 1981 in topping the AFC East with a 12-4 record. 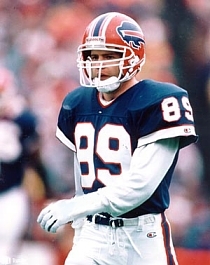 The aggressive defense, in particular the front seven that included ends Bruce Smith (pictured above) and Art Still, NT Fred Smerlas, and linebackers Cornelius Bennett and Shane Conlan was a big part of that success (although Conlan was out with a foot injury against the Oilers). The offense was conservative and led by capable QB Jim Kelly, who was joined as a Pro Bowl selection by WR Andre Reed. Rookie RB Thurman Thomas brought immediate improvement to the ground game. Houston reached the postseason for the second straight season under Head Coach Jerry Glanville. The exciting run-and-shoot offense featured Warren Moon at quarterback, who missed five games due to a shoulder injury but still was chosen for the Pro Bowl, and a fine group of wide receivers led by Drew Hill, Haywood Jeffires, and Ernest Givins. The Oilers could run the ball effectively with running backs Mike Rozier and Allen Pinkett plus FB Alonzo Highsmith. The defense was aggressive – and prone to late hits and penalties – but also tended to give up points. There were 79,532 fans at Rich Stadium on an unusually mild winter’s day in upstate New York. Following a short possession and punt by the Oilers, Buffalo drove to the Houston 18. A bad snap on a third-and-10 play set the Bills back to the 32 and Scott Norwood was short on a 50-yard field goal attempt. 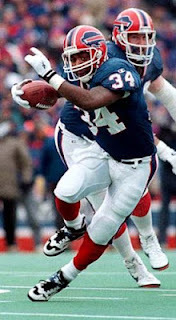 Houston was again unable to move on offense and the Bills, taking over at their 26, drove all the way to the Houston three yard line, with the big play a 40-yard run by Thurman Thomas (pictured at left). But the attempt to convert a fourth-and-one situation failed when Kelly’s pass was incomplete. The Oilers responded with a series that carried into the second quarter and reached the Buffalo 34. However, Moon was sacked for a 13-yard loss by Bruce Smith on a third down play and the ensuing punt was blocked by safety Leonard Smith, thus giving the Bills the ball at the Houston 46. Buffalo finally capitalized as Kelly threw to WR Trumaine Johnson for 18 yards and again for another nine yards before Thomas carried to the three. Two plays later RB Robb Riddick dove into the end zone from a yard out and, with the successful PAT, the Bills were ahead by 7-0. The Oilers came back with an 11-play, 71-yard drive. Moon threw to Drew Hill for 21 yards and Alonzo Highsmith ran for 31 yards on a draw play. The possession stalled at the Buffalo 18 and Tony Zendejas kicked a 35-yard field goal. Following a short series by the Bills, Houston again drove into Buffalo territory. Moon connected with Haywood Jeffires for 27 yards and then threw to Ernest Givins to reach the Buffalo 25. But the Oilers came up empty when Bruce Smith blocked a 38-yard field goal attempt by Zendejas. The score remained 7-3 at the half. Early in the third quarter DB Tracey Eaton intercepted a Kelly pass to give the Oilers possession at the Buffalo 47. With Highsmith and Mike Rozier running the ball and an unnecessary roughness penalty on the Bills helping the series along, Houston again missed an opportunity when an errant pitchout inside the five yard line lost 12 yards and then Zendejas was wide to the left on a 31-yard field goal try. The teams traded punts as neither offense was able to sustain a drive until late in the third quarter when the Bills went 59 yards in six plays. Kelly threw to WR Chris Burkett for 26 yards and, three plays later, he scrambled for ten yards on a third down play that had a facemask penalty tacked on to advance the ball to the Houston 11. From there, Thomas ran for a touchdown and a 14-3 lead. Before the third quarter was over, Kelly passed to Andre Reed for a 55-yard gain to the Houston two. However, the Bills couldn’t punch the ball in from there and on the first play of the final period Riddick was stopped for no gain on fourth down. The Oilers gained no benefit from the goal line stand as a Moon pass was intercepted by FS Mark Kelso two plays later. Norwood booted a 27-yard field goal to extend Buffalo’s lead to two touchdowns. The Oilers turned the ball over again on their next series as Jeffires fumbled after catching a pass and CB Derrick Burroughs recovered at the Houston 23. The Bills failed to expand their margin when Norwood’s 36-yard field goal attempt hit the left upright and was no good. Desperately needing to get points on the board, the Oilers went 80 yards in nine plays. Moon completed four passes, including one to WR Leonard Harris that gained 29 yards, and a pass interference penalty on Burroughs put the ball on the Buffalo one from where Rozier carried for a touchdown. The successful extra point pulled the Oilers to seven points behind with just over five minutes to play. The Oilers never got another chance on offense, however. The Bills managed to run over three minutes off the clock in their ensuing possession and, when they punted from the Houston 45, special teams star WR Steve Tasker caused Curtis Duncan to fumble and LB Ray Bentley recovered. The Bills were able to run out the clock to win by a score of 17-10. In a game in which both teams squandered numerous scoring opportunities, Buffalo led in total yards (372 to 351) while the Oilers accumulated the most first downs (20 to 18). Houston turned the ball over three times as the Bills, who turned it over once, made the bigger plays on defense. Jim Kelly went to the air more than usual, completing 19 of 33 passes for 244 yards with no touchdowns and one interception. Thurman Thomas only carried 7 times but gained 75 yards and scored a TD. Andre Reed topped the receivers with 6 catches for 91 yards. For the Oilers, Warren Moon was successful on 17 of 33 throws for 240 yards, also with no TDs and one picked off. Haywood Jeffires had 5 pass receptions for 78 yards and Drew Hill contributed four catches for 62 yards. Alonzo Highsmith gained 57 yards on just 5 carries while Mike Rozier had 44 yards and a touchdown on 13 attempts. Buffalo’s run ended the following week against Cincinnati in the AFC Championship game. They again won the AFC East in 1989, albeit with a lesser (9-7) record and with more difficulties along the way. Houston also went 9-7 in ’89 to once more qualify for the postseason as a Wild Card team and again fell short in the playoffs by losing in the first round.